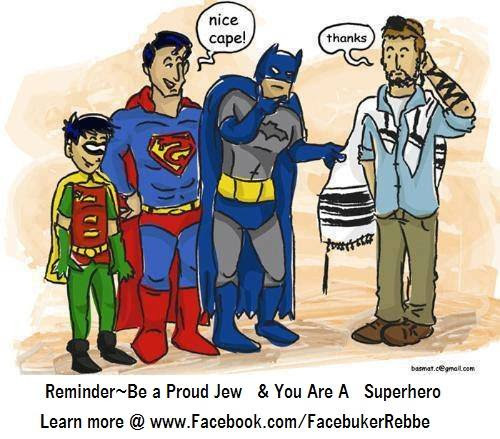 This is a guy who was not going to put on tzitzit in the morning, but he decided to put them on and they ended up saving his life! Great to see people so devoted to mitzvot! Kol Hakavod, Yossi! So I ran into this on the Facebuker Rebbe email (list in memory of Rabbi Dovid Winiarz z'l) and couldn't resist posting it. Shabbat Shalom and Happy Chanukah! Ner Echad just featured us back! 4torah.com is a search engine whereby people can look up Torah topics and come up with "kosher" results as opposed to whatever happens to be out there in the world, which may have heretical answers, etc. In the blogs - Thank you Ner Echad member Aimee Cohen! Aimee runs a website called4torah.com - a Torah-only search engine which sells Tzadik cards and prints, and they sell kosher Tzitziot and Tallaisim with the goal of offering them at cost so as to enable as many Jewish men as possible to have the opportunity to wear Tzitzit. Thank you Aimee for including us in your noble mission! This is a charity where many women all over the world pray for other women at candle-lighting time and give charity at the same time to the fund of Rebbetzin Kanievsky of blessed memory. I figure since we have a blog why not promote it here. The link below has all of their information and how to join - a really easy thing to do to help your fellow Jew and join together with women around the world. In this class, I don't remember at what point though, Rabbi Mizrachi mentions that one receives reward even for encouraging someone to upgrade their tzitziot from cotton to wool. He says that according to most opinions wool is preferable to use. Like most things there are arguments and according to some, cotton is equally as good and even preferable in some cases. Rabbi Mizrachi himself mentioned in a different class (I don't remember which) that the Steipler Gaon made it a point to wear cotton tzitzit to demonstrate that the rabbinical commandment supercedes a Torah commandment! Just to show you how halacha is dynamic. In any case, he says that even encouraging someone to a mitzvah behiddur, i.e. beautifying it, or keeping it on a higher level, accrues reward for the person who motivates the other to do so. The same would apply to upgrading one's mezuzot from a basic quality to a higher quality. We launched this blog and project to encourage more people to learn about and keep the mitzvah of tzitzit. If you want more information or to help us do so, please contact us here for different ways to help! There are so many possibilities, and by encouraging someone to wear tzitzit, you get a spiritual dividend for every second he wears them! Tzitzit – Wool, Cotton, or Nylon? Which fabrics are kosher? "One who meticulously observes the mitzvah of tzitzit is rewarded with [the resources to afford] a nice wardrobe." -- Talmud Shabbat 23b. Copyright www.Tzitzit.net Search Torah www.4Torah.com. Simple theme. Theme images by Airyelf. Powered by Blogger.